This course provides primary care providers with an overview of core clinical practices and competencies required to work effectively within an integrated healthcare system. 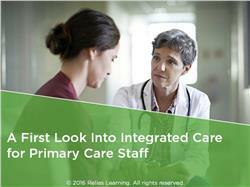 After learning the fundamentals of what constitutes an integrated healthcare system, you will gain key insights regarding how primary care providers can serve as part of a holistically-oriented integrated healthcare team. Didactic information is complemented by specific examples regarding clinical approaches in order to give you actionable take-aways that you can apply in your own setting. The content of this course was developed through a partnership between the SAMHSA-HRSA Center for Integrated Health Solutions (run by the National Council for Behavioral Health), the National Association of Deans and Directors of Schools of Social Work, the Council on Social Work Education, and with generous funding from the New York Community Trust. This course is appropriate for all medical staff responsible for physical health at a primary care provider. Describe the key elements of an integrated healthcare system. Cite examples of best clinical practices in the provision of integrated health care. List how medical professionals working in primary care can be effective members of a multidisciplinary integrated healthcare team. Robin Correll is a registered nurse with over 15 years of experience working with individuals with intellectual and developmental disabilities. Dr. Correll received her Bachelors of Science in Nursing Degree in Nursing in 1994 from the University of North Carolina at Charlotte. She graduated with a Masters of Science in Nursing in 1999 from the University of North Carolina at Charlotte. Dr. Correll received her Doctor of Nursing Practice from Samford University in Birmingham, Alabama in 2012. Dr. Correll has a wide variety of clinical experience and has worked in acute care, long-term care, intellectual and developmental disabilities, and behavioral health. Dr. Correll has been with RHA Health Services, Inc. since 1999 and currently serves as the Vice President of Nursing Services. Dr. Correll oversees nursing and clinical services in North Carolina, Georgia, and Tennessee. Disclosure: Robin Correll, PhD, MSN has declared that no conflict of interest, Relevant Financial Relationship or Relevant Non-Financial Relationship exists. The target audience for this course is: intermediate and advanced level Case Managers; intermediate and advanced level Nurses; intermediate and advanced level Social Workers; in the following settings: All Healthcare Settings.